This story of a father’s search to find a diagnosis, and ultimately a cure, for his son’s mystery disease is an inspiration that has set the world of genetic medicine and research abuzz with the possibilities for the future. After Cracking the Code screened on Australian Story Stephen Damiani and his extraordinary ordinary family, have been inundated with messages of support for Mission Massimo. Stephen has a background in construction economics and risk management. He teamed with geneticist Ryan Taft to map his family’s genome in an attempt to discover the cause of his son’s illness and in the process developed a diagnostic tool that will revolutionise diagnoses and treatments of diseases as complex and rare as Massimo’s leukodystrophy to widespread diseases such as diabetes and cardiovascular disease. Previously, trying to find a specific gene mutation that might be responsible for a disease was a million times harder than finding a needle in a haystack. Stephen’s suggestion that Ryan align the genomes, or DNA blueprints, of himself, his wife Sally as well as Massimo, to find any unique variations and thereby create a smaller haystack was previously untried. Stephen convinced Massimo’s neurologist, Dr Rick Leventer at Melbourne’s RCH, that it was just a case of technology, statistics, data, and money, but that it could be done. Once Taft was able to locate and isolate the specific genetic mutation of Massimo’s DARS gene, the hunt was on to find other children with the same genetic mutation so that the diagnoses could be confirmed. With the help of Dr Adeline Vanderver at the Children’s National Hospital in Washington DC, along with Prof. Marjo van der Knaap and Dr Nicole Wolf in Amsterdam, they were able to locate several other children with DARS mutations and have now moved on to the next phase of Mission Massimo: finding a cure. 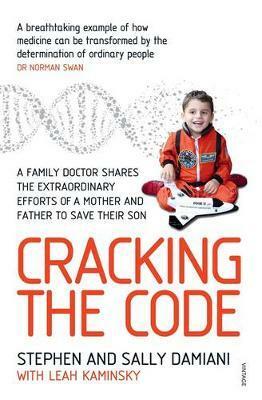 Cracking the Code is simultaneously a wonderful family memoir and the story of some mind-blowing discoveries in medicine.